Members of the Oklahoma Incentive Evaluation Commission prepare to choose the tax breaks they will review this year. Left to right: Lyle Roggow, Carlos Johnson, Cynthia Rogers and Jim Denton. A new state oversight panel has decided to target for scrutiny this year 11 business incentives that have been reducing state revenue by at least $110 million a year. The first-year targets include incentives for manufacturing plant expansions, wind-power electricity generators, historic building renovations and Oklahoma-based film productions. The first-year lineup was endorsed Wednesday by members of the Oklahoma Incentive Evaluation Commission. The recently appointed panel is scrambling to launch its reviews quickly so it can make a first round of recommendations to the Legislature and governor by the end of the year. The eight-member commission agreed to review a total of 53 business incentives over a four-year period. Those incentives are reducing state revenue collections by at least $475 million a year, tax officials estimated. Collectively, they are a significant contributor to the budget crises of recent years. –A five-year property tax exemption for new or expanded manufacturing plants is costing an average of $68 million annually. The tax break has been expanded over time to include research and development firms, computer services, data processing, aircraft repair and oil refineries. The state has been reimbursing counties and school districts for the lost property tax revenue. –An income tax credit for electricity generated by “wind farms” is reducing state revenues by an average of $27 million a year, a figure that is expected to escalate significantly in future years. The Legislature rejected a proposal this year to scale back the tax credit. –The Oklahoma film enhancement rebate pays out $5 million a year to producers of film, television productions and television advertising who do at least part of their production work in Oklahoma. –The historic building rehabilitation tax credit reduces taxes paid by developers who renovate buildings certified as historic structures by the federal government, which provides its own tax break. The credit is reducing state revenue by $4 million a year. –An income tax credit for aerospace engineers is costing the state at least $3 million a year. A separate tuition and compensation reimbursement program for their employers adds $1 million a year to the cost. –The four remaining incentives and their annual cost estimates are an industrial access road program, $2 million; the Quality Events Program, $385,000; a tax credit for manufacturers of small wind turbines, $179,000, and an excise tax exemption on aircraft sales, cost unknown. The four-year review schedule was approved unanimously by the four voting members who attended the commission meeting. The schedule was prepared by state officials and private consultants hired to do independent analyses of the incentive programs. The incentives chosen for the first round of evaluations will require less data collection than many of those to be considered in later years, officials said. The timetable is tight: The commission is expected to approve its initial recommendations in November and forward them to the governor and Legislature in December for possible legislative action in 2017. The analyses will be conducted in coming months by Public Financial Management, a private consulting firm. The Oklahoma consulting team is headed by the former state budget directors of New York and Iowa. The state is paying the firm about $240,000 a year for the work. –The Quality Jobs Program, which provides at least $73 million in annual rebates to manufacturers and other businesses that create or sustain employment. Three Quality Jobs spinoff programs also will be reviewed. –A capital gains deduction for investments in Oklahoma real estate and state-headquartered businesses, $115 million. –A tax credit for insurance companies that maintain “home offices” in Oklahoma, $46 million. The state oversight panel was created last year by lawmakers in response to growing pressure to rein in the escalating cost of business tax breaks, rebates and other incentives. It was supposed to be up and running by January, but it got a late start because state leaders were slow to nominate its members. The panel has five voting members: Roggow, president of the Duncan Area Economic Development Foundation; Jim Denton, a private sector auditor; Cynthia Rogers, a University of Oklahoma economics professor; Ron Brown, a private investigator who specializes in forensic accounting, and Carlos Johnson, a certified public accountant. 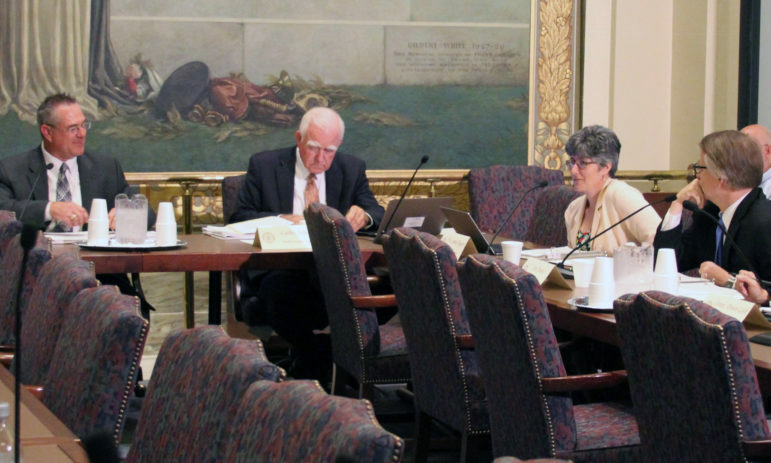 David Blatt, executive director of the independent Oklahoma Policy Institute, said it appeared that the new commission was developing some traction. “It’s encouraging that we’re moving ahead with a serious review of the major credits,” said Blatt, who attended the commission meeting.